An old priest once came to the church on Easter Sunday morning and brought with him an old rusty crooked birdcage and placed it beside the altar. Many people wondered and lifted their eyebrows when he spoke: “Yesterday I was walking through the town when I saw a boy who was carrying this cage. 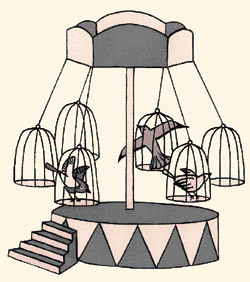 Inside the cage there were three little birds, shivering from cold and fear. I stopped him and asked: “What do you have here, my son?” “Only a pair of old birds,” he replied. “What are you going to do with them?” I asked. “Take them home and play with them”, he replied. “I will tease them to make them fight. I bet it will be fun.” “But sooner or later you will have enough, and the fun will be over. What will you do then?” “Well, I have also a few cats,” said the little boy. “It would be a delicious dinner for them.” I became speechless for a moment and then I whispered: “How much do you want for those birds, son?” “What??!!! And what would you do with them, father? They're just ordinary birds from the field. They don't sing and they are not nice at all!” “How much?” I asked again. The boy gave me a look like I was crazy and said: “A hundred dollars!” I reached into my pocket and gave him the money. At the end of the alley, near the tree, I opened the cage and knocked on the grid to convince the birds to fly away. This explains the presence of the cage in the church. Nice story. Beautiful as a painted vase. But let's take a better look what is hidden inside. The priest has done a good deed. He saved the old birds from the cat's claws and from poking of the boy, who is about to grow up into a real scallywag. Had he tried to save his soul instead of those birds, it would have been much different. Why not explain to the boy that the birds are also living creatures? He should have let the boy remember the situation, for example, when he fell and hit himself, how it hurt, or an illness, when he was “imprisoned” at home. The boy would perhaps even release the birds himself, without being persuaded with money. The priest could plant a seed of compassion and love into his soul, which would bring a great harvest. However, he gave him the money. A hundred dollars! Imagine what they can do today in the hands of such a brannigan. Cigarettes? Alcohol? Slot machines? Today, many children in the neighbourhood are addicted. And when he runs out of money that was so easily obtained, where can he get more of such money? Will he steal? By his “good works” the priest did not only put doubts on himself and the church in the boy's eyes, he also put doubts on the God's Word. It is naive to believe that the Son of God will ask for permission from some Lucifer, who is so dark and heavy that he cannot even raise to the lowest level of the celestial worlds. After all, this story makes Lucifer the Lord and Jesus the subordinated one! And the Son of God should pay him for something?! He who owns everything? The idea that Jesus paid for us with His blood and tears is just wishful thinking of people who would like to get rid of the gravity of their own sins, without any effort of their own will. The fact that the agreement between Lucifer and Jesus is imaginary and that Jesus did not pay anything for the people is confirmed by the fact that people keep on hating and harming each other, they are drinking, smoking, cursing and killing. The information about the dark “lord” condemning people is also a lie, because it is someone else who is competent to judge people. Someone with whom Lucifer could not be compared even if he was serving God. The only thing this fallen angel can do is to whisper ideas to people, as it was shown very well in this story. And if you still care about those birds, you should realize the following - what most of the church-goers have for lunch after they return home from church on Sunday? Impressed by the sermon - for example, by the story about the priest and the cage, they enjoy the taste of birds that were kept in appalling conditions, packed in cages and slaughtered ruthlessly on an assembly line.